Making a small outdoor living space a beautiful oasis is not impossible! Tiny outdoor areas can be cozy, and if done with creativity can become the perfect space that can be utilized by everyone in your home. Here are some fantastic small outdoor patio design ideas that can make a petite patio look great and inviting. A great way to utilize any outdoor space, regardless of its size, is the placement of your outdoor furniture. Placing your pieces in a way that opens up your patio area can help make the space seem larger in size. Placing tall items in the corners of your space can make it feel wider and more expansive. If you have taller outdoor potted plants or lighting, placing them in the corners of your space can naturally bring a person’s eyes upward, making it seem taller and wider. Choosing rectangular or oval shapes can make an area appear longer. If you are dealing with a rectangular porch, work with the natural shape of the space provided. Build upward and not into the center of your space, to avoid the feeling of being overcrowded. 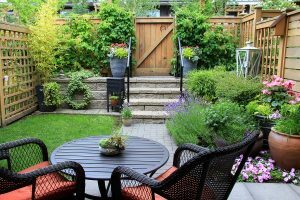 Plants, flowers, or tiny gardens can be a great way to turn a smaller patio into a space that is pleasing to the eye. Bringing brighter colored plants and flowers to the foreground and adding tiny shrubs to the background can give your space some needed depth. Covering fences with free-climbing growing vines can create an illusion of boundaries that are more appealing to look at. Plants like these can also bring color and a lush feeling to smaller spaces. Small patio design ideas that not only bring color, but open your space are also a great way to bring life and happiness to an otherwise crowded area. Lighting in a small patio area is essential. Fairy lights throughout an outdoor area is beautiful especially in the summer evenings. If you are looking to open up your area, a light trifecta in the shape of a triangle is best. Light fixtures placed high and in the corners of your porch space can make your area seem more expansive. Try not to crowd your space too many added small pieces. Having one big focal point can take the attention away from the size of any space. Small outdoor patio design ideas executed with purpose and creativity can greatly open up your petite space. Making it a relaxing and personal area to call your own.